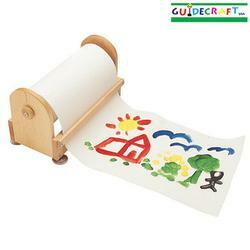 This handy solid wood paper center sits on the floor or table. Features a child-safe cutter and 4 non-marking feet for stability. Includes one 12" x 300' roll of paper. 14 1/2" long x 7" wide x 8 3/4" high. dditional shipping charges apply. Method of shipping is UPS Standard. Materials: Birch Ply, paper roll.